Each week, we round up the latest headlines on trends and technologies shaping the future of advertising and communications. It’s part inspiration, part education and all about helping our team and our clients grow. It wouldn’t be a round-up of what’s hot this week if we didn’t find a way to work in Game of Thrones. Check out this 6-minute read on the wide-ranging partnerships HBO forged leading up to this weekend’s final-season premiere. (Did you know a star-studded soundtrack is coming?) Also worth your attention: this podcast in which HBO’s evp / president of marketing talks the multi-faceted For The Throne campaign and those unexpected brand tie-ins (hi, Bud Knight). Google+ rose (June 2011) and fell (April 2019). Snapchat debuted as the first social channel featuring ephemeral content (September 2011). Smart speakers hit the market (Amazon Echo in June 2015, Google Home in November 2016). Instagram rolled out Stories (August 2016). Mobile overtook desktop as the primary way we access the internet (November 2016). OTT went mainstream, with 52% of all U.S. adults using at least one streaming service (just this week – which makes the enduring must-watch-live nature of Thrones all the more noteworthy amid limitless shows and services vying for attention). Next up: three headlines in the world of voice – and why they matter. First up, Pandora is set to start testing interactive voice ads later this year. Users will be able to respond verbally to ask for more info or skip the ad. Why it matters: First, interactive voice ads will measure user engagement – something traditional audio ads can’t do. Second, they’ll allow advertisers to engage listeners at otherwise inopportune times – think while working out or driving. In voice assistant news, Walmart and Google have teamed up to bring voice ordering to your grocery cart. Add items to your list via any Google Assistant device, then collect from 2,000+ participating locations. Why it matters: If it works well, this is a great example of a brand combining user behavior insight and an emerging solution to make life a little easier. It’ll be voice experiences built for genuine user needs that will stand out in the sea of 60,000+ skills and actions (and counting). And in the interest of fair and balanced reporting, some Alexa news: Amazon announced this week it’ll now offer long-form news in addition to its already-popular Flash Briefings. Why it matters: It’s logical to think longer-form content creates new openings for ad placements – both from publishers like NPR (which already incorporates advertisers in Flash Briefings) and Amazon itself. AR’s hot – and VR’s not – for publishers. What does it mean for media relations? 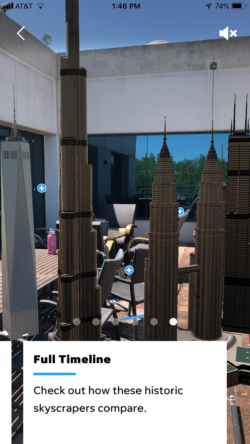 USA Today made headlines this week with an augmented reality feature about the world’s tallest skyscrapers. It was cool. It’s one thing to read Dubai’s Burj Khalifa is almost 1,000 feet taller than One World Trade Center. It’s another to see and walk around the two buildings side-by-side. First, publishers are pivoting toward AR in their experimentation with immersive news coverage because it’s more accessible than VR – anyone with a smartphone can experience it. Second, it’s a reminder today’s reporters are tasked with producing a whole lot more than a 1,000-word byline. They’re also on the hook for video, social media and e-news content, and yes, more sticky, engaging experiences that employ new storytelling devices like AR. What’s that mean for PR pros and their creative partners? There’s no question media relations is harder today than ever before – but so is reporting. Consider packaging pitches not only to capture coverage, but also to help reporters feed the never-ending demand for supporting content – for example, with vertical visuals for an Instagram Stories teaser, an expert for a Twitter chat, or “sidebar” video that could be used on social or a teaser blog. Fun fact: The average user scrolls 300 feet of social media content on his or her smartphone every day. Need to put that in perspective? It’s about the height of the Statue of Liberty or Big Ben.  Check out how Honda is using this stat to challenge drivers to 300 feet of real-life adventure in its new SUV campaign. That’s it for this week. Have thoughts or a favorite example of an AR news feature you want to share? Let’s talk on Twitter. Photo by Markus Bürkle from Pexels.